You’ll have to visit Purisma Creek Redwoods Open Space Preserve soon…the baby quails are out in full force. My husband and I hiked from the trailhead to the Soda Gulch trail on Sunday and encountered three different families. Quail mamas are especially cute when they have babies following along. 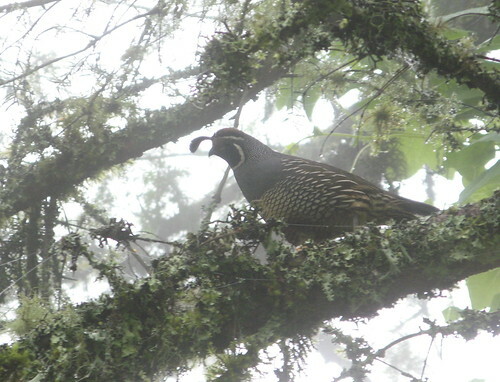 Please send along your Purisima or quail picture links — both are quite photogenic. ← Trekking poles for women — any such thing? Yeah, they’re out by the dozen at Del Valle, too…along with young turklets! Saw 3 dozen turkey chicks with 5 adults at Pleasanton Ridge last week…’tis the season! Hi. I’ve been checking out some hiking blogs in the area and this one seems great! THe reason I was checking these out is because I’m interning this summer for Merrell and I am in charge of posting job openings for the new Merrell store that will be opening up on Union Square in San Francisco. I thought who better to work for such a great outdoor brand than the people most excited about the outdoors? Anyways, there’s a job fair next week, June 25 & 26 from 10am-3pm at the Hilton San Francisco Hotel (333 O’Farrell Street, Lombard Room in Tower 3, 6th Floor). Have a great week and thanks for posting all the beautiful pictures! I was just in Purisima on Sunday. I love that place. Purisima is one of my favorites, even though the trilliums are probably all gone by now. Interesting terrain changes, beautiful scenery, and nice views. More pics of same write-up.